I've been meaning to try this for awhile because it has so many great reviews. Many people have noticed that their skin texture improved and they broke out less. I have only been using it for few days now but I will be reviewing it after 6 months. Mia2 is much easier to handle. Unlike Mia, Mia2 also has 2 different speeds and a buzzer to tell you when to move on to next part of your face. Aria has 3 different speeds (Mia2 has 2). Unlike Mia2, it also has battery indicator light and USB charger. It really depends on your preferences. Personally, I chose Mia2 instead of Mia because I like the buzzing feature it has and I heard it's easier to handle than Mia. As for Aria, I didn't buy that one because the additional features don't seem to be worth the extra $50. I should be fine with the 2 different speeds. I also knew I would barely use the USB charger and I'm indifferent to the battery indicator light. It doesn't really have importance to me. It is suggested that you replace the brush head every 3 to 4 months. If you don't like the sensitive brush head that it came with, then you can look through the other brush others. They have a variety of them depending on your skin type. You can get a replacement brush head for $31 or get twin-pack for about $49. Many people go through the purging stage: all the dirt and debris that was trapped in your pores comes on the surface of your skin, so you break out. This normally lasts few weeks but it can be as long as a month or 2 for some people. I read the instructions and charged it for about 24 hours before using it. I wet my face and brush head with warm water; then applied Fresh Soy Face Cleanser on the brush head but you can also apply it on your face instead of the brush head. I placed it on my face (starting forehead) and moved it in circular motions. It will buzz to move on to next area. It's fairly easy to use. I used normal speed and it didn't irritate my skin at all. It removed my face makeup effectively. My face felt so clean after. I did feel a bit of discomfort at first but then I was fine. I think it was just something new to me but then I got used to it. I was a little worried that it mat irritate my combination skin. I have a bit of redness on my nose and cheeks but it didn't irritate my skin at all. I've been using mostly Lush products in the past few months. Click here to read more about my skin care routine before the Clarisonic. I use LUSH Angels on Bare Skin Cleanser only in the morning because it's very gentle and moisturizing but it doesn't remove makeup effectively. So now I use the Fresh Soy Face Cleanser for night time with my Mia2 and all my makeup is removed with the exception of eye makeup (I simply remove it with makeup remover before). I stopped using SEPHORA COLLECTION Precision Pore Cleansing Pad , which is a good tool that you can get for about $8 CAD from Sephora but it obviously doesn't clean as well as the Clarisonic. I've been using this twice daily but some people say they use it only once a day or every other day. 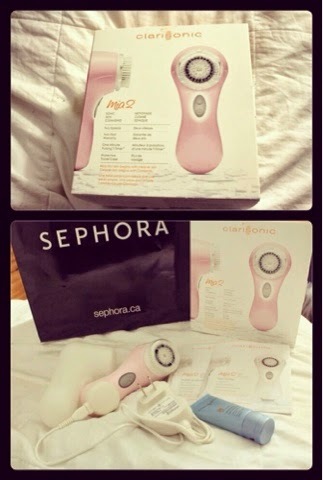 I previously used SEPHORA COLLECTION Precision Pore Cleansing Pad twice daily, so it was easy to incorporate the Mia2 in my routine. In the past few months, I noticed I've been breaking out a lot though, so I'm hoping this will help me out with that.